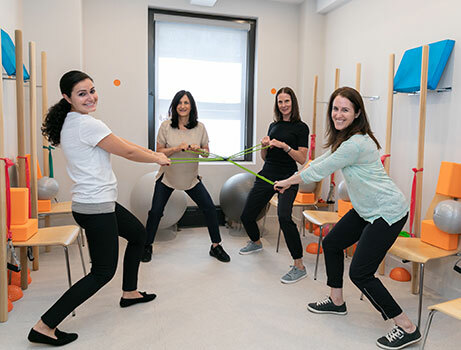 BACK INTO BALANCE is a boutique Physical Therapy practice that strives to uncover the source of imbalance in the body instead of just treating the symptoms. Our focus is on an hour and a half comprehensive evaluation of a patient’s body and lifestyle: a proactive plan is created to educate patients on how to exercise properly and take care of their body as it ages. Our experienced physical therapists spend one hour working individually with each patient. Prevention is the cornerstone of our philosophy and we encourage bi-annual body “check ups” to strategically manage the aging process. Small group exercise for those 60+ to improve balance, posture and functional strength. The guidance of our Physical Therapists will ensure correct alignment in a safe, injury free exercise environment. Stand tall and challenge your balance! Very often, people wait for a “now what” moment to turn to physical therapy. Instead of waiting for the injury, the pain or fall to see us, we want to see you now! Now is the time to be both preventive and proactive. We can identify potential red flags for you as you age before they develop into chronic problems. We can work with you, your trainer, your yoga or Pilates instructor or at your gym to customize any work out regime to meet your needs while avoiding injury. We can keep you functioning within your best capabilities to keep you active and social. You are living longer. We can help you live better. Read more about why NOW is the time to get started. WE PROVIDE an hour of 1:1 Physical Therapy by an experienced physical therapist in our private office and in patients homes. WE COMMUNICATE with your Physician and often accompany patients to their follow up doctor appointments. WE EDUCATE patients how to successfully meet the challenges of a continually changing body as we age. WE DESIGN individually tailored exercise programs that enable patients to fully participate in life’s daily activities. WE TEACH strategies that maximize energy, minimize fatigue and build the confidence necessary to stay engaged in life. WE ENCOURAGE a preventive biannual check in (up) to re-evaluate physical changes and fine tune your exercise program accordingly. WE RESTORE balance and put the bounce back in your step!